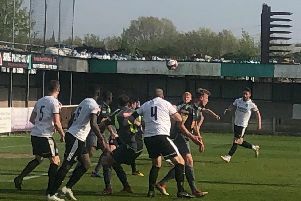 An unbeaten three match run, after the agony of losing seven on the trot, has almost certainly ensured Matlock’s survival in the top flight of the Evo-Stik NPL. Mark Hume’s men will need to lose all of their last four matches, albeit in a punishing end of season schedule, and Hyde United collect maximum points for the Cheshire side to have even a glimmer of hope of overhauling the Gladiators. Security for Matlock is enhanced with their goal difference being 17 better than Hyde’s. Substitute Jack Siddall’s 92nd-minute equaliser earned the most precious of points against high flying Stourbridge on Tuesday, this following another draw, 2-2 at Sutton Coldfield last weekend, after the earlier 2-0 home win over basement side Ramsbottom United. Town make the return trip to Ramsbottom tonight (Thursday) before second placed Blyth Spartans are at the Autoworld Arena on Saturday for Matlock’s final home game of the campaign which ends with trips to Workington on Tuesday and Barwell on the final day. Injuries are a problem for Hume at present. Adam Yates, having missed matches recently with back spasms, was forced to sit out the Stourbridge clash in the hope he will have recovered sufficiently for Ramsbottom, while midfielder Nicky Travis broke down in the warm up and has to be rated doubtful for both Ramsbottom and Blyth. With Danny Holland still feeling the after effects of an illness, and Laurie Wilson now out for the rest of the campaign with ankle trouble, Matlock’s resources are again stretched. But Hume will not use these fitness problems as an excuse as he approaches games against sides who have experienced highly differing fortunes. Ramsbottom were relegated after the loss at Matlock and may play without fear now their fate has been sealed. Blyth were surprisingly beaten at home by Skelmersdale last weekend while Darlington were winning at Grantham. The Quakers then beat Skelmersdale in midweek to take over the league leadership and look strong favourites for the title. Blyth will know that only a win at the Autoworld Arena will do. “It’ll not be an easy game at Ramsbottom,” Hume warned. “They’re relegated but have nothing to lose and may blood some new players with a point to prove, so we’ve got to go there with the right attitude. “Blyth are a good side as we know but there’ll be pressure on them so that could work for us and we’ve got to try and be positive. A win on Thursday could give us that extra confidence for a big game against Blyth. Hume acknowledged Matlock were unfortunate not to win at Sutton Coldfield and he praised the battling qualities shown against Stourbridge. “We had chances and played some good football on the 3G, I think Ted Cribley wouldn’t mind a 3G all the time although I’m not a fan of it. But we had a job to do, and it’s a pity those late chances didn’t go in for I felt we were worth the three points. Then on Tuesday we battled really well, and kept on going which was pleasing. Siddall has now scored three goals from the bench this term after being promoted from the reserves.